Archiving Issues and Submittals should be done as outlined in a previous post. As projects progress, there may be a need to save prior versions. Milestones are reached in the design that are not at a submittal point. Changes in the design cause major reworking of files. Saving the older versions can come in handy if the client or the designer needs to step back to a prior version. There also may be a need to archive unused non-issued project-wide data. When this is needed, it should be done in an “Archive” folder. The folder will be broken down similar to the Issue folder. No official Issue data goes into the Archive folder. Project archives are for snapshots of the project at internal milestones. If a major design change will take place, you may want to archive the old data before it is modified. The purpose of this data is so that you can refer to it or regain some files if needed later. 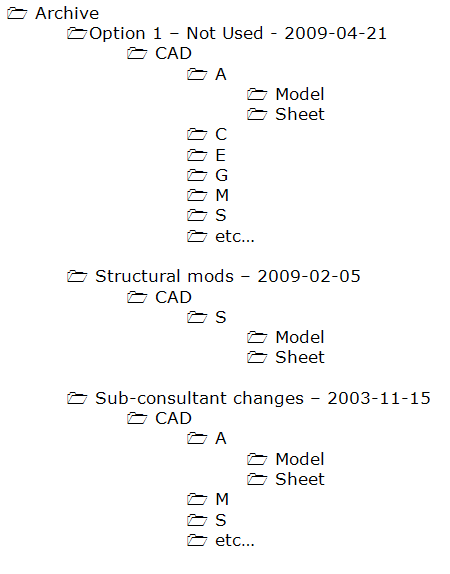 The “live” CAD files remain in the proper folders and continue to be developed. When another milestone is reached another archive may be created under the Archive folder.